While searching for some old documents the other day, I came across a yellowed envelope containing my report cards from elementary school. Savvy of me to save these through fire, flood and cross-country moves, right? Maybe I thought they would impress an employer someday or smooth my way into grad school. Funny how something so important then is so totally irrelevant now. But here’s what I had forgotten about the education I received at that little country school. 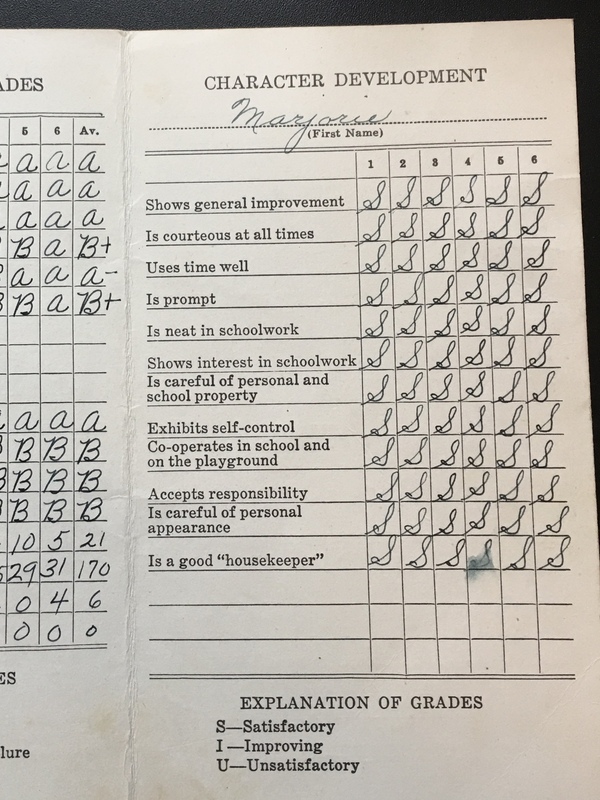 A staff of only four teachers shared instruction for all eight grades.Elementary school teachers were primarily female in those days, and they worked extremely hard (that hasn’t changed!). 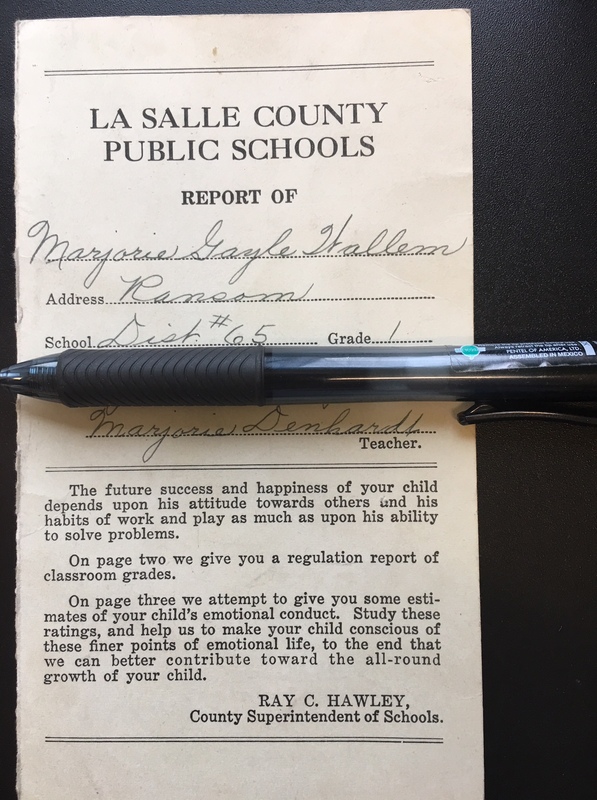 With classes of 40 students spanning two grade-levels, Ransom Consolidated Grade School teachers were responsible for not only the 3 R’s but also language, spelling, science and health, history, geography, civics, art and physical education. A part-time instructor handled music; the rest was up to the classroom educators. Given the need to evaluate their students in so many academic areas, who could expect these modestly-paid public servants to care about much else other than stopping spitwads and breaking up fights? But a glance at my card reminds me that they were responsible for developing character as well as content. Were we students “courteous at all times”? Did we use our time well, exhibit discipline and accept personal responsibility? Appearance mattered – not what we looked like but whether we cared. Most important of all, were we genuinely trying to improve? After so many decades, I had forgotten that the first lessons instilled in me in school were not how well I performed academically but whether I was developing socially. Character counted. Nothing has changed, and yet everything has. As Americans we are electing public servants (ironic that we continue to use that term) whose moral compass is either missing or spinning wildly in unpredictable directions. As long as they pass the litmus test of a voting checklist, we dismiss their moral failures and lack of respect for the truth. Yet there is One who will ultimately judge us all, and his Word makes his will clear. The grades we receive in grade school, high school or even college will not change the world. But women or men who have been shaped into the character of Jesus ? Yes, they can. And they most assuredly will. We can be dismissed as a character, or we can actually develop one that will transform the lives of others. Character counts. Like the way yours adds up? Absolutely excellent, Maggie. Thank you. What a wonderful reminder of the kind of education we received as kids growing up in the American Public School system in the 1950’s and 1960’s. Do they even emphasize these qualities in school today? Really enjoyed your piece. Thanks again for your hospitality and generosity with your home and your time. I realize that Mike, especially, could have spent much more time with old friends and swim team members and we really appreciate you both giving so much of your time to be with us. It was a great weekend. If they could give anything higher than an “S”, I’m sure you would have gotten that too. Not that I am prejudiced or anything. Mom, it’s funny that in those days the best you could get was “satisfactory.” No “great job” or “well done”! But I like the fact that character development was emphasized in public school. Thanks for being my greatest cheerleader! If only we emphasized character more today it would make such a difference. Thanks for the reminder. Maggie, another great blog. Wondering to your mom what kind of comments we had on our report cards from the teachers in Hendricks Elementary School, Keep up the good work. Maggie, what words of encouragement as we end a grading term and embark on the task of writing comments on each of our students’ report cards! Thank you for reminding us that what ultimately matters is our students’ (and our own) character, not their grades. Dorothy, thank you for reading this post and for your comment. That’s encouraging to me. Hugs sister!